Korea’s population is one of the most ethnically and linguistically homogenous in the world. Approximately one-half of South Korea’s population lives in or near the capital Seoul, the country’s largest city. Seoul is one of the most populous metropolitan areas in the world, a major centre of business and commerce in Asia and home to many of the world’s largest transnational corporations such as Samsung, Hyundai, SK and LG. South Korea today is a fully functioning modern democracy. It had one of the fastest economic developments in the world since the 1960s and is now the 3rd largest economy in Asia and the 11th largest economy in the world. South Korea is one of the world’s most technologically and scientifically advanced countries. It is also a major international economic power. An independent Korean state or collection of states has existed almost continuously for several millennia. Between its initial unification in the 7th century – from three predecessor Korean states – until the 20th century, Korea existed as a single independent country. In 1905, following the Russo-Japanese War, Korea became a protectorate of imperial Japan, and in 1910 it was annexed as a colony. Korea regained its independence following Japan’s surrender to the United States in 1945. After World War II, a Republic of Korea was set up in the southern half of the Korean Peninsula while a Communist-style government was installed in the north. During the Korean War (1950-53), US troops and UN forces fought alongside soldiers to defend South Korea from North attacks supported by China and the Soviet Union. An armistice was signed in 1953, splitting the peninsula along a demilitarized zone at about the 38th parallel. In 1993, Kim Young-Sam became South Korea’s first civilian president following 32 years of military rule. Since the 1960s, South Korea has achieved an incredible record of growth and integration into the high-tech modern world economy. This was achieved by a system of close government/business ties, including directed credit, import restrictions, sponsorship of specific industries, and a strong labor effort. The government promoted the import of raw materials and technology at the expense of consumer goods and encouraged savings and investment over consumption. The Asian financial crisis of 1997-99 exposed longstanding weaknesses in South Korea’s development model, including high debt/equity ratios, massive foreign borrowing, and an undisciplined financial sector. Moderate inflation, low unemployment, an export surplus, and fairly equal distribution of income characterize this solid economy. 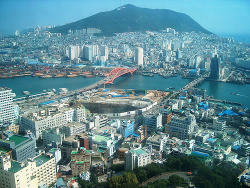 South Korea occupies the southern portion of the Korean Peninsula, which extends some 1,100 km from the Asian mainland. This mountainous peninsula is flanked by the Yellow Sea to the west, and the Sea of Japan (East Sea) to the east. Its southern tip lies on the Korea Strait and the East China Sea. South Korea can be divided into four general regions: an eastern region of high mountain ranges and narrow coastal plains; a western region of broad coastal plains, river basins, and rolling hills; a southwestern region of mountains and valleys; and a southeastern region dominated by the broad basin of the Nakdong River. South Korea’s land is mountainous, and most of it is not arable. Lowlands, located primarily in the west and southeast, constitute only 30% of the total land area. About three thousand islands, mostly small and uninhabited, lie off the western and southern coasts. The local climate is relatively temperate, with precipitation heavier in summer during a short rainy season and winters that can be bitterly cold. Winter temperatures are higher along the southern coast and considerably lower in the mountainous interior. Rainfall is concentrated in the summer months of June through September. South Korea shares its traditional culture with North Korea, but the two Koreas have developed distinct contemporary forms of culture since the peninsula was divided in 1945. Korean art and culture have absorbed influences from many countries; prior to the 19th century, these cultural infusions came primarily from China. Koreans adapted many Chinese art forms with innovation and skill, creating distinctively Korean forms. In modern times, Western and particularly the US influences have been strongest. In the aftermath of Japanese occupation all Japanese cultural exports were banned from Korea until 1999. In recent times, Korean pop culture has become popular in Asia and beyond. Recent Korean films have also received international acclaim. The contemporary culture of South Korea is heavily dominated by technology, including feature-rich cell phones and pervasive online gaming. South Korea today has the highest penetration of high-speed internet access to households in the world. South Korea’s entertainment industry has grown substantially since the 1990s, producing Asia-wide successes in music, television, and film in a phenomenon known as the “Korean wave.” However, the country still retains centuries-old customs and traditions, such as its unique cuisine and ancestor worship. In South Korea, education is highly regarded and very competitive. A centralized administration oversees the process for the education of children from kindergarten to third grade high school. Mathematics, science, Korean, social studies, and English are generally considered to be the most important subjects. Sometimes, physical education is not considered important, as it is not regarded to be education, and, therefore, many schools lack high-quality gymnasiums and varsity athletics. South Korea was the first country in the world to provide high-speed internet access from every primary, junior, and high school. The school year is divided into two semesters. The first begins in mid-February and ends in June; the second begins in late August and ends in mid- to late December. The schedules are not rigidly standardized, however, and can vary from school to school. Kindergarten in South Korea is composed of children from ages three to five. Most children do not attend “preschool” but are lumped together in a kindergarten class with other children who may be within a three years age difference. When the child reaches about six years of age he/she is systematically moved on to the first year of elementary school. From kindergarten to high school, matriculating through the grade levels is not determined on knowledge, grades or passing of any tests, but is based purely upon the students age. Elementary school consists of grades one to six. Students learn subjects including, but not limited to, Korean, mathematics, science, social studies, language arts, fine arts, and music. Competitive entrance examinations at the middle-school level were abolished in 1968. Although as of the late 1980s, students still had to pass noncompetitive qualifying examinations, they were assigned to secondary institutions by lottery, or else by location within the boundary of the school district. Secondary schools, formerly ranked according to the quality of their students, have been equalized, with a portion of good, mediocre, and poor students being assigned to each one. High schools in South Korea teach students from first grade (age 15) to third grade (age 17), and students commonly graduate at age 18. As in middle school, students stay in their homerooms and are not tracked by ability. A student may choose, however, the class he or she wishes to take for liberal arts. High schools in Korea may also have subject specialty tracks. For example, university-bound students may choose to go to an academic science or foreign language specialty high school. It is not abnormal for many students to arrive home from school at midnight. The curriculum is rigorous, and many students attend private academies called 학원 (學院, pronounced hagwons) as supplements to boost academic performance. As the university entrance examination is such an important factor in education, many parents spend a significant portion of their income to send their children to these institutes in order to prepare them for the exam. High school is not strictly mandatory. However, according to a 2005 study of OECD member countries, some 97% of South Korea’s young adults do complete high school. This was the highest percentage recorded in any country. Many students who complete high school education apply to be accepted in South Korea’s various universities and technical colleges. There are many national universities as well as private universities. National universities are supported by government and it usually regarded as better education than private ones. There are 10 major national universities in South Korea, which are taking a leading role on higher education in each metropolitan area or provinces as well as many other national universities. However, most of prestigious private universities are mainly located in Seoul with few exceptions. The acronym SKY is often used to indicate the three most prestigious and highly desired universities in Korea: Seoul National University, Korea University, and Yonsei University. Korea retains many aspects of the Joseon Dynasty and Japanese education systems, the most influential of which is probably the use of entrance examinations to determine eligibility to attend the highest-level universities. The entrance examinations test most subjects taught in school, including math, science, English, history, and economics. From an early age, students prepare to take the university entrance examination, and the curriculum of most schools is determined by the content of the entrance examination to a large extent. In addition, many parents enroll their children in cram schools from an early age—many as early as elementary school. The number of students in higher education had risen from 100,000 in 1960 to 1.3 million in 1987, and the proportion of college-age students in higher-education institutions was second only to the United States.